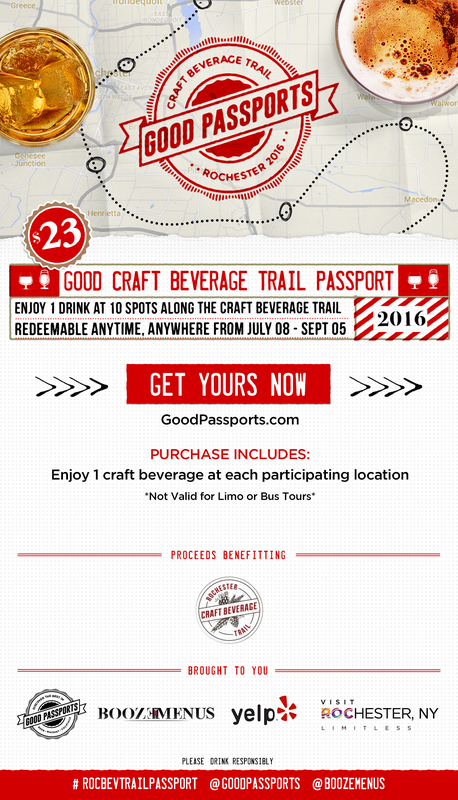 Good Passports, BoozeMenus, Yelp Rochester and Visit Rochester have teamed up to present The Craft Beverage Trail Passport, which will raise funds for The Rochester Craft Beverage Trail. By purchasing the Craft Beverage Trail Passport, you’ll get one house made spirit / cocktail, beer, wine or cider at each location. You can use the Passport on any day, at any time that the locations are open from July 8, 2016 through September 5, 2016. Passports are available for pick-up at Black Button Distilling from July 8, 2016 through September 3, 2016. Tuesday and Wednesday: 12:00-6:00 p.m.
Thursday and Friday: 12:00-9:00 p.m.
Bring your Passport to each of the participating locations any day from July 8 through September 5, 2016 and choose one house made spirit / cocktail, beer, wine or cider. Ask the bartender which cocktails or spirits you can choose from. Please remember to tip your bartenders, as gratuity is not included. Good Passports work with bars, restaurants, breweries and alcohol retailers to drive in customers by creating limited-time promotions with multiple venues. Customers acquire a Passport that guides them around a city where they get to sample various drinks at a number of different locations. By purchasing a Passport, customers also receive a periodic email newsletter alerting them of cool and exclusive events from the participating locations. BoozeMenus is THE source for cocktails and nightlife in NYC. Take the guesswork out of your social life search with the all-encompassing guide to venues, new openings, cocktail & spirit trends, parties and more. Experience Rochester through one of its greatest craft industries. From beer brewed with locally grown hops to vodka distilled with wheat grown along Conesus Lake, our craft drinks are made with pride. So follow the trail, find your new go-to drink, and meet amazing people along the way. Cheers, my friend, and welcome to our city. Visit Rochester is Monroe County’s official tourism promotion agency. A multifaceted organization dedicated to attracting visitors to our region, assisting visitors in finding the best that Rochester, and the Finger Lakes, have to offer and inviting and encouraging visitors to return again and again. Yelp connects people to great local businesses. Visit Yelp Rochester or download the free Yelp app for recommendations on everything from bars to burgers!